Wednesday Noon Day Prayer 12:00 p.m.
Line Dancing Mondays 6 - 8:00 p.m.
Aerobic Classes Tues & Thurs. 6 - 7:00 p.m.
Men's Fellowship Every 2nd Saturday of the month 9:00 a.m.
History The following "Brief History of St. Luke's U.A.M.E. Church" is taken from the Home Directory of the Colored People of Chester, 1906 compiled by Lawrence L. Barrett & C. I. Wilson. This reference is available at the DCHS research library. 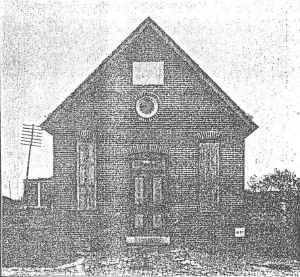 In 1897, St. Luke's Tabernacle, No. 3, began holding services in Riley's Hall, on Edwards street, above Third, for the expressed object of raising funds for charitable purposes, with no intention of establishing a church. One of the most active members of that body was Rev. A. A. Parsons, the present pastor, at that time a local preacher in St. Daniel's M. E. Church. After due consideration, twelve members of the lodge agreed upon the idea of establishing a mission. Thereupon, Rev. Parsons surrendered his license as a local preacher to the proper authorities of St. Daniel's M. E. Church, and became the pastor of the St. Luke's mission. December 16, 1897, the mission moved to Flower street, taking up quarters in Kelly's building, formerly occupied at different times as a paint shop and tin shop. January 26,k 1898, they were organized as a branch of the Colored Methodist Episcopal Church of America. During the same year removal was made to Central avenue, below Fifth street, on property leased from James Frazier. After tearing down a stable that stood on the property, a frame structure was built. The church stood in the midst of frame buildings. In 1899 a fire broke out, destroying the two frame houses adjoining and the church building. The church property being covered by insurance, the congregation was enabled to buy the present site. The new building was begun in 1899, completed and dedicated January 21st, 1900. The church property is estimated by the officials at four thousand dollars ($4,000), with a remaining indebtedness of three hundred dollars ($300). Death has removed the following prominent members: Robert Jordan, local preacher; Noah Kershaw, Henry Chapman and Sarah C. Delaware. On April 6, 1906, articles of transfer were signed by the proper officials with Bishop B. T. Ruley, of the U.A.M.E. Church, and is now known as the St. Luke's U.A.M.E. Church. The record shows an enrollment of fifty-six active members. The following is the official list of Trustees, Stewards and Stewardesses: Ennols Queen, Richard Scott, Hiram Delaware, Emmett Brown, Lewis Winchester, Edward Davis, Stephen Harding, William Taylor, Perry Henry Turner, C. T. View, Mrs. Eliza Rosier, Rhoda Brown, Mary Daniels, Annie R. View, Laura Winchester, Louisa Hackett, Rachel Queen, Ella Gibson, Sarah Johnson, Elizabeth Dale. William D. Davis, Sunday School Superintendent.